Christmas is here. And while it may not seem to be a Christmas message on its face, the passage from John that is today’s reading expresses the core message of Christmas: God is here. Jesus – closer to God than anyone, there with God from the start, and himself God – is the one who reveals God to us. Jesus is not just an idea or picture of God, not just sent by God, but is God. He became a man, a human child, to show us God in a way we can understand. In a newborn baby, born to a family of no importance in a town of little regard, is God. The awaited king. The Savior. Not just in heaven, unreachable, removed from the daily toil and struggle of humanity, but here among us. The light in the darkness, recognized only by a few, who by His sacrifice made us into our true, child-of-God selves. Will you welcome Him? Will you celebrate not just in His birth but in the commands He gave us to live by? Will you allow His light to guide your path? God is here. Merry Christmas. This is the season of gifts and giving. This is the festival of the birthday of the Holy and Perfect Gift, of the Way of Life and the way to live, brought to us by the most generous Giver that ever lived -- Christ Jesus. In Him as a Child in the manger "were brought the gifts of kings" the three Wise Men came from far places to pay homage and leave their token of esteem. And it is these Wise Men that we should imitate, going as far as we can to give God the best we have to offer, going in person and laying it at this feet. What can we give him? Perhaps he wants our prayers. He wants also for us not to have evil in ourselves and to help other live up to the good that is in them. He wants all of us to walk his path and help others who have not found it or who maybe lost it along the way and then grown weary. It is obvious that the world was dominated by the Romans - rules, chest pounding, trumpets etc. While this circus was taking place, a simple Jewish women gave birth to a son and placed him in a manger. There was no room in the Inn but they were surrounded by animals, angels and love. It is a simple thought, reminding us what is important. People in Power will come and go- each of us will survive and thrive if we hold dear to us the ways of the baby, Our savio r- born to Mary and Joseph in Bethlehem. Whatever the incarnation is about, it is about hope and Good News for the oppressed and lowly. It is Good News for those who flee the dehumanizing reality of violence. It is Good News for children who cry while the proud, the powerful and the rich decide their fate. It is Good News for mothers and fathers who find the courage to leave the fearful Herods of our modern world and follow the star of hope: hope for a future for their children and their children’s children. It is good news for this tiny, nameless child who cries for all the world to see. 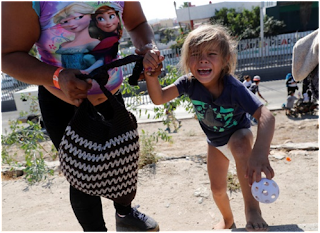 The promise of Christmas is “good things” for crying children and their parents. What is Mary’s message for those who are “proud in the thoughts of their hearts?” for the “powerful on their thrones?” for “the rich?” What is Mary’s message for us? Good news….for whom? Have you ever been inspired by the words of someone chosen by God? God’s world is changing; where is it going? Nations are raging; look at their fear! We wait in faith, for God’s reign is near. “Look at the fig tree!” See what it’s doing. Look at the signs in heaven above. Some are afraid, but we know God’s love. This world is drifting, filled with distraction! Many are wandering; some fall away. We wait in faith! We’re ready for action. We’re on our guard to greet God’s new day. What should we do, Lord, while we are waiting? Some just sit back while troubles increase. Others respond by fighting and hating. We hear your call to work for your peace. Helping the hungry, homeless and poor. When Christ will come and reign evermore. Text: Copyright © 2010 Carolyn Winfrey Gillette. Used by permission. The next time you’re in church take a look at hymn #355. The tune, Vineyard Haven composed in 1986 by Fred Anderson is set in a minor key. Usually minor keys are associated with unhappy texts and the psalmist is definitely writing about unhappy times. The people of Israel are looking for their nation to be restored. They’ve been the scorn of their neighbors and are laughed at by their enemies. They want their Shepherd to listen to and help them. Shepherds spend their days caring for and protecting their sheep, so of course the Israelites want God to care and protect them. Are we much different from them? Don’t we also long for God’s help and saving grace? We often feel cut off from God, but He remains our Shepherd. Twice in the first seven verses the psalmist asks God to let his face shine. The psalmist is asking God to turn his face towards Israel so that they may be saved. How many times do we turn away from God and miss his blessing? We need to actively seek God in our lives, so that his love may shine on us. Salvation depends completely on God. We think God will hear and answer us, but as the psalmist writes not even our prayers can always bring forth God’s Favor. We need to wait for God’s gift.